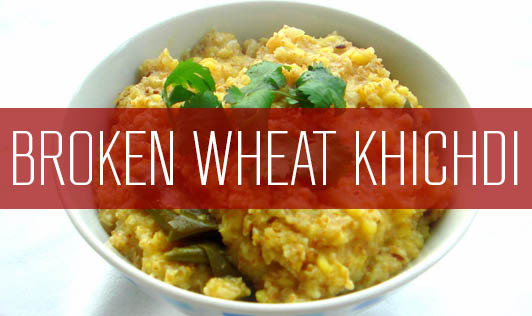 Here is a nutritious meal with broken wheat which provides calcium, folic acid, fibre, iron, and other nutrients. Include broken wheat (Bulgar wheat) in your diet to add variety to your daily meals. 1. Soak the cleaned and washed bulgur wheat and dal for 15 minutes. Drain and keep aside. 2. Put 2 cups of water to boil and keep aside. 3. Heat the pressure cooker, add the cumin seeds, cloves and cardamom and dry roast for about 30 seconds. 4. Add the onions and ginger-garlic paste and dry roast for few more seconds. 5. Add the bulgur wheat, moong dal, peas and tomatoes and dry roast for another 1 minute while stirring continuously. 6. Add the turmeric powder, chilli powder, salt and the hot water, mix well and pressure cook for 3 whistles. 7. Allow the steam to escape before opening the lid. 8. Stir the khichdi, adding a little hot water if required so that the dal and the bulgur wheat mix well. 9. Serve hot with low fat curds.